PS: HC-11 can not be connected to communicate with the HC-12, they work independently, in pairs. Default communication distance (open test): about 600m (adjustable to achieve the maximum communication distance of 1000m, the air baud rate 5000bps). The default idle current: 16MA (modules in different operating current of the different operating modes). Module Size: 27.8mm × 14.4mm × 4mm. The default factory settings: operating mode FU3, baud rate 9600bps, communication channel CH001 (433.4M). As shown above, HC-12 module is used instead of the half-duplex communication physical connection to the left of the serial device sends data to the module, the module receives the left RXD port serial data, the data is automatically sent by way of radio waves into the air. The right of the module can automatically receive and restore the left side of the device was originally issued by the serial data from the TXD. From right to left is the same. 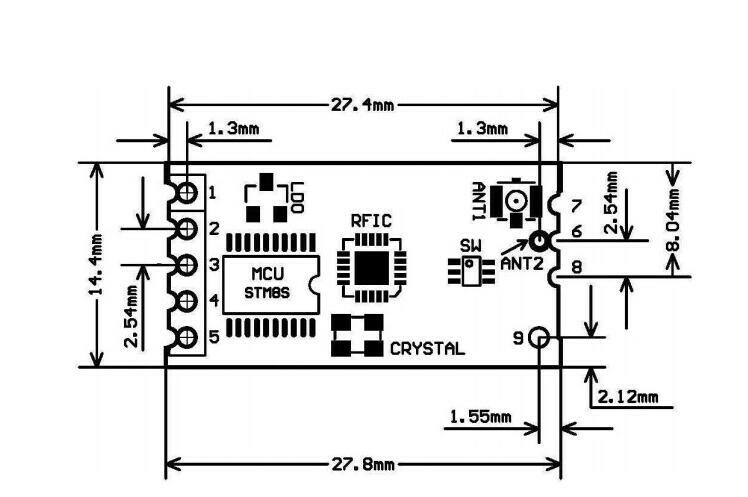 HC-12 module has three serial pass-through mode, using FU1, FU2 and FU3 said. When used, the various models are just to send and receive serial data, wireless transmission portion of the air tube. The default work under FU3 full mode, which automatically adjusts air baud serial port baud rate according to at low baud communication distances. Different modes can not exchange data, the user can select the optimal mode according to the actual situation. When using generally do not limit the number of bytes to a continuous serial transmission module. However, in view of factors such as environmental disturbance, when a large amount of data sent continuously, there may be missing some bytes. So, the PC is best to have the response and retransmission mechanisms to avoid loss of information. AT command is used to set the parameters of the function module and switching modules need to exit the setting mode after setting to take effect. Meanwhile, modify the parameters and functions, power-down is not lost. The second mode of entry - power, 5th pin "SET" again first set low on power. Both methods can make the module into AT command mode, release ("SET" pin is not connected low) to exit command mode. After the exit command mode, if you change the module function, the function will be cut to the appropriate state. The second way is fixed in serial format 9600, N, 1 into the AT. Send module commands "AT", the module returns "OK". Change the serial port baud rate command. You can set the baud rate is 1200bps, 2400bps, 4800bps, 9600bps, 19200bps, 38400bps, 57600bps and 115200bps. The factory default is 9600bps. Change the wireless communication channel, selectable from 001 to 127 (more than 100 radio channels after the communication distance not guaranteed). The default value is 001 radio channels, operating frequency is 433.4MHz. Step channel is 400KHz, the operating frequency of the channel 100 is 473.0 MHz. Set module to channel 21, please send module command "AT + C021", the module returns "OK + C021". After exiting the command mode, the module in the first 21 channels, operating frequency is 441.4 MHz. 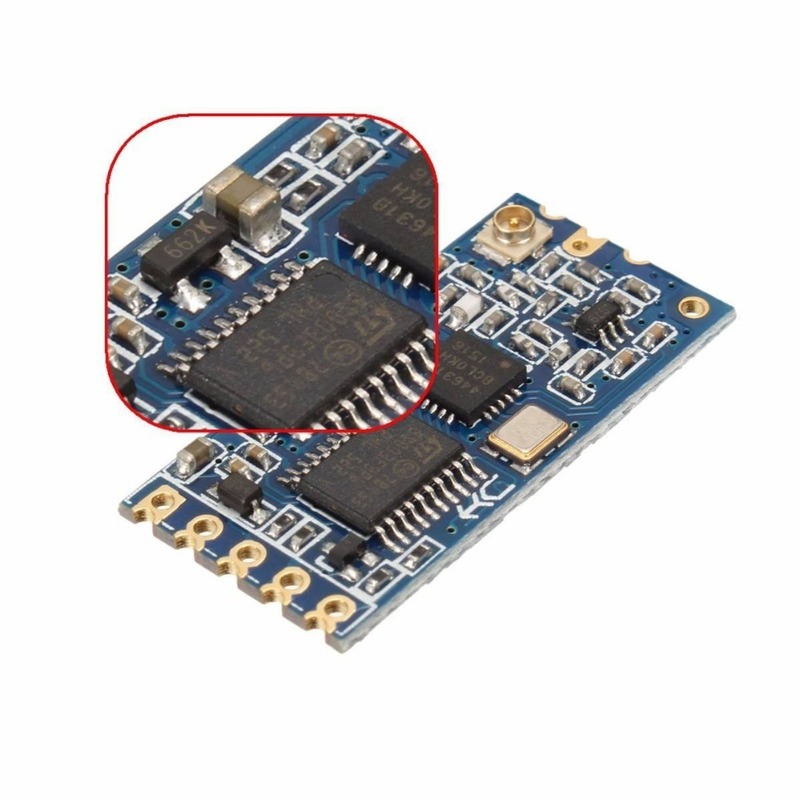 Note: Because the wireless receiver module sensitivity HC-12 is relatively high, the baud rate is greater than when air 58000 bps, 5 must be shifted to the adjacent channel use. When the air baud rate is not greater than 58000 bps, if the short distance (10 meters) communication, but also need to stagger five adjacent channel use. 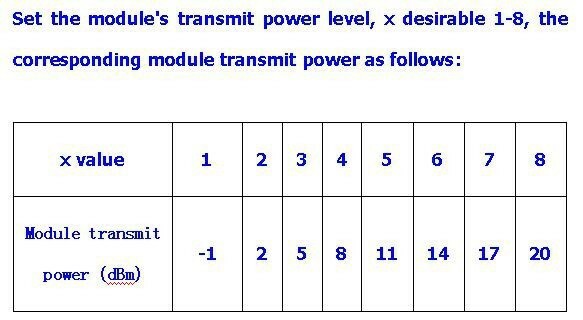 Change the module serial pass-through mode, there FU1, FU2 and FU3 three modes. Module default mode is FU3, two serial pass-through mode module must be set to the same communication. See detailed above, "wireless serial pass-through" part. Send module commands "AT + FU1", the module returns "AT + OK".